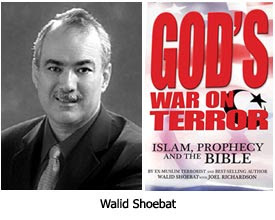 The book God's War on Terror: Islam, Prophecy and the Bible published in 2008 by Walid Shoebat with the aid of Joel Richardson, adds very little to the Muslim Antichrist debate, but it does clarify some issues. The meaning of Psalm 83 is specifically addressed.43 Shoebat attempts to prove that the war described in this psalm between Israel and its adjacent Arab neighbors is one that will occur at the end of the Tribulation, after the Second Coming of the Messiah. In other words it will be a part of the Armageddon Campaign that will include the Battle of Gog and Magog. Thus, he argues it will be a conflict between forces led by Jesus and those led by the Mahdi. I was astonished to read this interpretation because I have studied this psalm in detail, and there is not one verse in it that even implies that Jesus will be present on this earth when the battle occurs. Psalm 82:8 — "Arise, O God, judge the earth!" Psalm 80:14 — "Return, we beseech You, O God of hosts." This kind of incredibly sloppy proof-texting can be found throughout Shoebat's book. Whenever he wants to make a point, he goes fishing for a verse. When he finds it, he reels it in and applies it to the issue under consideration, whether it is related to that issue or not. Another example can be found in the second argument he gives for placing the Psalm 83 war at the end of the Tribulation. He says it must occur at that time because it is a war triggered by the Antichrist's desecration of the Jewish Temple — a temple that will be rebuilt during the first half of the Tribulation. And what is his evidence? He quotes Psalm 79:1 — "O God, the nations have invaded Your inheritance; they have defiled Your holy temple. "44 Once again, he tries to prove a point about Psalm 83 by quoting a verse from an unrelated psalm that is most likely describing the destruction of Solomon's Temple. Shoebat displays some tortuous logic throughout his book. A good example can be found in his attempt to explain away the meaning of Daniel 9:26, a passage Richardson avoided dealing with in his book. The plain sense meaning of this passage is that the Antichrist will come from the people who will destroy the Temple. But Shoebat's argument here is really grasping at straws in the wind! For one thing, the ethnicity of the soldiers is irrelevant because the Romans never used mercenaries. All their soldiers were citizens of Rome. But it would not have made any difference if the legions had been composed of Australian Aborigines, for it was the Roman government that decided to destroy Jerusalem, it was the Roman government that gave the orders, and it was Roman generals who carried out the destruction. Rome was the rod of God's judgment and it is from the Roman people that the Antichrist will arise. The condensed Islamic creed, shown to the right, literally means (reading right to left): "In the Name of Allah," followed by the symbol of crossed swords. He then observes that the Greek text for 666 (shown to the right) looks like the Islamic creed except that the word, "Allah," is presented vertically, with the crossed swords to the left of it. In the last installment of this evaluation of the Muslim Antichrist Theory, I'll make some final objections and conclude why I do not believe this theory holds water. 41) Shoebat, God's War on Terror, pages 197-198. 46) Sean Osborne, "Some Additional Thoughts on 'Debunking the European Antichrist' by Rodrigo Silva," http://eschatologytoday.blogspot.com/2009/02/some-thoughts-on-debunking-european.html. Further comments by Sean Osborne can be found on the Prophecy Depot blog in response to an article by Bill Salus, "Does Daniel Debunk the Assyrian Antichrist?" http://prophecydepot.blogspot.com/2009/01/does-daniel-debunk-assyrian-antichrist.html. Another brilliant article Dr. Reagan. Unless I am mistaken, Vaticanus is infamously unreliable anyway, as it does not contain the Revelation. I think it finished part way through Hebrews? It came from the Gnostic Library of Alexandria in Egypt. They were renowned for removing ‘inconvenient’ swathes of Scripture; while WS seems to prefer distortion. Read Josephus regarding who was in the Roman military. It supports Walid's statement about them not being Roman. Regarding Ezekiel 38, let me ask you a few questions regarding the timing of this campaign. Why in Ez 38:8 does it say in "the latter years, you will go against the land RESTORED from War...the people brought out from the peoples who now dwell securely"? Is Israel dwelling securely? When will they dwell securely? After the Lord returns. When are they RESTORED from War? After the Lord Returns. I had to read Ezekiel searching for a time frame and because of the dwelling securely, we know Israel will not dwell securely until the L-rd's return. We also know the people being gathered will happen after another exile mentioned in Zechariah and throughout the scriptures. And do you stand on your theory? Everybody is against someones interpretation of Biblical Prophesy. To me, I think the anti-christ will be a muslim somewhere around Israel. And do believe brother Walid Shoebat is on key with his theory's, I support his interpretation. Since 2001 I have always believed Islam will play a major role in these last days we are living in. Looking at all the writings above...they are just way too similar to not have SOME relevance. Scripture says that we will know the signs, seasons, and the prophesies will make sense when the time is near. With all that is occurring, the Islam faith being the contradiction (Anti-Christ) of the message of Christ, ie: that quote "Abraham will sit at the right hand of God or Allah" not Jesus, that he will return and claim he never died for anyone's redemption... and be-headings still a part of Islam as well as head-bands... .this is sure making more sense than prior Christian Prophesy notions. Looking around, we are supposed to know the signs...not it to be just a mystery only Christian theologians "Know". My opinion only, thank you for listening. Blessings! Israel will dwell securely for 3.5yr after she signs the "Covenant" with antiChrist. Then AC will seat himself in the Temple and begin annihilating Jews. 144,000 Jews will be brought out from among those who dwelt securely for 3.5yr. I first read Joel Richardson's book, 'Mideast Best' and then discovered Shoebat. I have listened to several hours of his lectures, talks, etc. I would encourage any serious Bible student to hear what he has to say. I believe his knowledge of the languages and his Eastern mindset adds a missing element to the eschatology discussion. ‘We Americans’, as Walid would say have not had our antennas up. Mine are much more tuned in after hearing Walid Shoebat speak about Islam, End Times, Prophesy, and how clear the Bible speaks to each. It has opened my eyes. In 133BC this particular area in question was given to Rome on the death of the last independent king. As such it became part of the Roman Empire and the people there became citizens of Rome. Therefore, eligible to join the primus legion or the 1st chort. It is also well know that Rome also recruited local conquered peoples to serve in the legions as soldiers. Having served their term they were granted citizenship. Not to mention that auxiliaries also fought alongside the legions as support combat troops and horse mounted troops. All these points support Shoebats position just as much as your claims. While I don't agree with Shoebat on all his arguments. Like the rapture or the psalms war. He is 100% correct in saying that nowhere in the bible does God name any nation other then current Muslim nations in which he will fight. I think the current eschatology of the European anti Christ, the pope and the 7 hills has LESS validity then the arguement he makes. While I don't necessarily buy into the aribic script position he holds. The interpretation of using a non scriptural kabala numbering system is not much better. Gods word shows us that the beast is Islam and an Assyrian Micah 5:5,Isaiah 31:8 ,Isaiah 10:24 and he comes out from the Islamic empire in Dan. 7 , 8, and 11 and is not the Roman Empire in Rev. 17 and is not "Rome" the empire during the time of this revelation. Gog is Appoloyn from Magog the sphere of Appolyons authority Turkey and the territories/nations of the black sea region Gog is the Vizer of Assur or the MUSLIM Head of state for Satan.